We are happy to welcome our seasonal volunteers back each year for a new summer adventure. 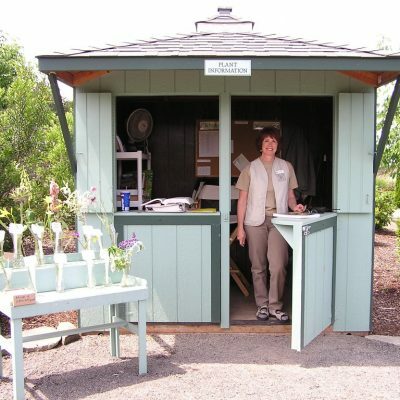 Short term (3 months or less) and seasonal volunteer opportunities are available at The Oregon Garden. We are now accepting applications for Greeters, Information Booth, Retail Nursery, Visitor Center​ and Membership Ambassadors. Please submit a Seasonal Volunteer Application and our Volunteer Coordinator will contact you for an interview and to schedule orientation. Schedules will begin in mid to late May. During our busier season, May – October, volunteers are needed to assist with our visitors as Greeters, in our Retail Nursery, Information Booth and Gift Shop. Volunteer Orientation and Customer Service training must be completed before your first volunteer shift and can be scheduled with the Volunteer Coordinator once your volunteer application has been submitted. Shifts are generally 3 to 4 hours and are generally available daily between May and October. College Work Experience (CWE), Internships, school community service requirements, and other short term volunteer opportunities exist with our Horticulture Department and occasionally with our Visitor Services Department. Short term volunteer positions are those that have both a start and finish date set at the beginning of your volunteer experience. Information about Internships and Horticulture can be found here. Shifts are generally 3 hours and are available Monday – Saturday year-round. We will begin accepting applications for our Visitor Services positions on April 1st. Visitor Services positions begin in May and run through September/October. Applications for Horticulture Volunteers are accepted year-round and positions are available weekly (Monday – Saturday). Step 2: Interview with the Volunteer Coordinator. Upon receiving your application, we will contact you to set up an appointment. This interview will help us place you as a volunteer. Step 3: Attend Volunteer Orientation. These sessions introduce you to The Oregon Garden, our history, policies and procedures. Step 4: Begin having a great time volunteering! Please visit the Online Scheduling Portal to schedule your volunteer shifts. Your username is your email address and you created a password when you submitted your volunteer application. Forgot your password? From the Portal entry page, click the “Forgot Your Password” link and follow the directions to set up a new one. If you have volunteered with us before, you do not need to submit a new application, just log into the Portal and schedule your volunteer shift. For full instructions on using the Portal to schedule volunteer shifts, see our Volunteer Portal Instruction Guide.